You can create and embroider large designs without re-hooping up to 240x150mm (9 ½” x 6”). The large DESIGNER™ Jewel Hoop 240x150mm (9 ½” x 6″) is included with your DESIGNER JADE™ 35. 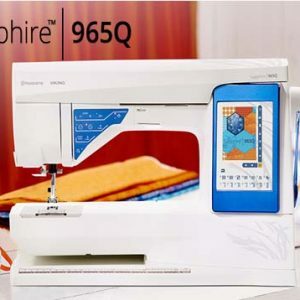 Our top-of-the line sewing machine, SAPPHIRE™ 965Q, offers many features to assist and guide you throughout your sewing. On top of that it has a vibrant Interactive Color Touch Screen. Use your stylus and navigate between different menus and functions. It has never been easier! Most settings are made by the machine itself based on what fabric or stitch you are using. All you have to do is focus on what you love! Sewing! 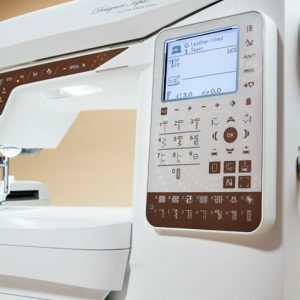 A sewing and embroidery machine with great capacity offering EXCLUSIVE SENSOR SYSTEM™ and a large sewing and embroidery area. Great value for money!